The Postseason Grades series continues with a look at Jeff Francoeur. Sigh. What is there to say about Jeff Francoeur? The numbers are ugly: 63 PA, .194/.206/.226, 2 extra-base hits (both doubles), one walk, twelve strikeouts. He was so bad. By this time next year, you will likely have forgotten Francoeur was ever on the Giants. Do you ever play the “who can name the more obscure Giant?” game with your friends? I sure do. In five or ten years, you will win that game if you can remember Jeff Francoeur. The circumstances that led to his signing are defensible. He was good in 2011, and he’s been good against lefties in his career. With Andres Torres starting in center field after the injury to Angel Pagan, the team needed a right-handed platoon partner for Gregor Blanco in left field. The odds of Francoeur contributing significantly to the Giants in 2013 were long, but what did the team have left to lose? They had just completed a 10-17 June and they were 1-6 so far in July. They were in fourth in the NL West, 6.5 games out of first. Brian Sabean and the front office were in a desperate situation. Instead of gutting the farm – like they did in 2011 to acquire Carlos Beltran – they decided to roll the dice of a few different long shots. Jeff Francoeur was one of those long shots. I can’t fault the thought process, even though it didn’t work out. Well, you probably would imagine yourself a better hitter — which is the real life part of the story. Francoeur will probably catch on with someone next year – he always seems to. He’ll likely toil away in AAA, or maybe he’ll have a hot spring and make a 25-man roster somewhere. I hope this isn’t the last we’ve seen of Jeff Francoeur. 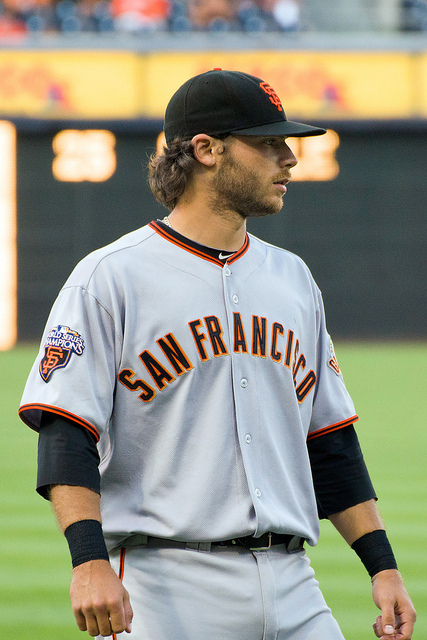 I just hope it’s the last we’ve seen of him in a SF Giants jersey. Our series continues as Nathan looks at Kensuke Tanaka. If he didn’t have such a great story, Kensuke Tanaka is exactly the kind of player you would forget about as soon as he was gone. You can’t sum up Tanaka’s season by looking at his stats (34 PA, .267/.353/.267); if I tried this wouldn’t be a very long article. Tanaka’s 2013 wasn’t about the stats; it wasn’t about the 15 games he played in, the 21 days he spent on the active roster, or the 0.3 WAR he contributed. It was about the culmination of a 14-year long journey, and a dream realized. From a baseball operations standpoint, Tanaka was little more than a shot in the dark. When he signed with the Giants in January, Tanaka was a 31-year-old international free agent who had played the first 13 years of his career for the Hokkaido Nippon Ham Fighters of the Nippon Professional Baseball League. A career .286/.356/.384 hitter in Japan, he was brought in to compete for the backup second base job, along with Wilson Valdez, Tony Abreu, and Nick Noonan. He didn’t get the job and went to Fresno, where he split time between second base and left field. He was called up on July 9th, and appeared as a left fielder and pinch hitter until he was sent back down on July 29th. Unfortunately, he was not brought up when rosters expanded in September. Tanaka reportedly passed up a guaranteed contract worth $3 million in Japan to sign a minor league contract with the Giants. When asked why he would give up a guaranteed contract for a minor league deal with the Giants, he said “I wanted to learn the culture of America, I wanted to play baseball here. And I wanted a challenge.” (From an Andrew Baggarly column last spring.) Tanaka met that challenge head-on and gave it everything he had, even switching to a position he hadn’t played since 2006 in order to get a shot. A shot is what he earned, and he made the most of it, even getting a few highlight-reel plays in the process. Listen to crowd in that second clip. Watch as the relief, exhilaration, and joy wash over his face. First career hits are often fun highlights to watch, but Tanaka’s has something special. It feels a bit strange to end this post with our grades of Tanaka’s season, because his season wasn’t about the grade. On one hand, he was a largely-forgettable second-baseman-turned-outfielder. On the other, his season was the triumphant culmination of a life spent playing baseball, one that peaked with 21 days at the top of the baseball world. My hat is off to you, Kensuke Tanaka. Congratulations. No, it’s not 2008. Not 2009 for that matter, either. It’s 2013 — not exactly the best year for Timmy, let alone a good year for the Giants. Batting out of lineup order. Losing in 16 innings because of an error. Oh, hey, Jeff Francoeur, what up. I am happy about this. Almost unironically. Can I explain it? No, not really. He’s an awful player. As it turns out, the Giants are pretty bad, too. How does this help the Giants? Honestly, I don’t think it helps them at all. It’s not an upgrade, really. There’s really no reason to acquire a Jeff Francoeur-type, let alone the actual Jeff Francoeur. This Giants team is a mess. That much is obvious. They’re 11-24 since June 1st, nine games under .500 and 6.5 games out of first in the NL West. They’ve been hurt by injuries and ineffectiveness. The pitching has actually rebounded from a dreadful start to be somewhat respectable, but they can’t hit at all. The outfield has been of particular concern. The outlook is bleak for Pagan returning this season, and the team has had to plug that hole by playing Gregor Blanco and Andres Torres a lot more than they’d like, particularly Torres. Now, Torres is a hero in SF, and rightfully so, after his 2010 season, but this year he looks…well, he looks like a 35-year-old. He can’t hit righties at all (.571 OPS this year), and he’s looked shaky on defense. To help Torres out, the following players have constituted a sort of revolving door of fifth outfielders: Francisco Peguero, Juan Perez, Cole Gillespie, and now Kensuke Tanaka. In addition, the team signed Jeff Francoeur and assigned him to Fresno; he’ll be up within the week. The purpose of this post isn’t to talk about the various pluses and minuses of the players named above, nor is it to propose a solution to the left field problem. It is to make a simple point: Gary Brown is not the answer. Gary Brown is not ready. I’ve seen some rumblings around the internet that the Giants should call up “top prospect” Gary Brown to be the next option, either in left or in center (pushing Blanco to left). This is a bad idea. Gary Brown is, right now, not a viable option for playing time in San Francisco. There are two big reasons for this: one, Gary Brown isn’t that good right now, and two, Gary Brown is still a prospect. First, Gary Brown has had an up-and-down year in AAA. His April was dreadful (.535 OPS) and his May, while better, was still pretty bad (.692 OPS). Sometime in early June Brown sat down with Fresno hitting coach Russ Morman and Giants’ coordinator of minor league instruction Shane Turner, and whatever they talked about worked. He’s hit .285/.335/.536 in 164 PA since June 1st. 8 of his 11 home runs this year have come since the start of June. These are all good things. That being said he has a 38-to-9 strikeout-to-walk ratio since June 1st, and a 91-to-23 ratio overall this season. He’s striking out a lot – even when he’s hitting the ball well – and he’d certainly continue to do that in SF. He also isn’t hitting righties. This year he’s .240/.298/.409 against them, and for his career he hasn’t been much better. Torres also isn’t hitting righties – making a Torres/Brown platoon rather ineffective – and this is the sort of thing he should work on in Fresno. It’s worth pointing out as well that all of the players I mentioned above , the cast of characters that have paraded in and out of the fifth-outfield spot, has performed better in Fresno than Brown. Brown’s .723 OPS in Fresno is lower than Tanaka’s (.786), Gillespie’s (.816), Perez’s (.838), and Peguero’s (.762), as well as Roger Kieschnick’s (.816) who may also get a shot sometime between now and September. Which leads me to my second point: Gary Brown is still a prospect. Sure, the prospect sheen of 2012, when he was Baseball America’s #38 overall prospect, has faded, but he’s still a 24-year-old in his third professional season. He’s a developing player who still has a lot of developing to go. Developing doesn’t happen at the end of the bench in San Francisco, it happens by getting four or five plate appearances per day in Fresno. If Manny Ramirez is back in pro-USA baseball, why not? It cannot possibly be any worse than how the Giants are right now. You were probably watching the game. On Monday night, Madison Bumgarner threw a gem: 7.0 IP, 4 H, 1 R, 1 BB, 5 K. The only real mistake he made was giving up a home run to world-beater Yasiel Puig in the first inning. He had thrown 107 pitches. Despite 8 hits and 4 walks off the Dodgers’ starter, Hyun-jin Ryu, the Giants had only managed to score one run, and so the game was tied at one apiece. In the top of the eighth, the Giants went down in order, and the game proceeded to the bottom of the eighth. And Madison Bumgarner came out to pitch in the bottom of the eighth. Ty Blach, the San Francisco Giants’ fifth round pick in 2012, kicked off his first full year in pro ball with the San Jose Giants, San Francisco’s high-A affiliate. The strike-throwing lefty has been experiencing success, posting a 2.73 ERA and 2.21 FIP in nine games started. In 52.2 innings pitched, Blach has struck out 48 and only given up five walks. Having good control and throwing strikes has been a key to his success. On May 1, 2012, the Giants were 12-11, four and a half games back of the first place Dodgers and in fourth place, with a run differential of +3. Today, May 1, 2013, the Giants are 15-12, just one game back of the first place Rockies and tied with the Diamondbacks, and a game and a half up on the fourth place Dodgers, with a run differential of +4. From another angle, through 27 games in 2012, the Giants were 13-14, five games back of the first place Dodgers with Arizona and Colorado just half a game behind, a +2 run differential, and just one win removed from fourth place, a negative run differential, and a four game losing streak after being swept at home by the Marlins. The Marlins. I was at the last game of that series and it was pretty miserable, let me tell you. Now don’t get me wrong, I’m not saying the Giants are somehow guaranteed to have the season go their way because they’re a bit better off than they were at this time last year. As we should all be painfully aware by now, baseball is strange, unpredictable, sometimes cruel, and basically always capricious. Everything could click into place, mechanical issues and nagging injuries could resolve themselves, and the Giants could go on to win 100+ games, or the bottom could fall out and they could end up missing the playoffs, there’s no way to know right now. But that’s exactly the point, there’s basically no way to know right now. This time last year Angel Pagan looked like he might never hit again and that he was an awful fit for the lead-off spot without any obvious replacement, most of us were still quietly praying that none of Buster Posey’s limbs fell off, and Pablo Sandoval was about to miss yet another month-plus with his second hamate fracture in as many years. And yet, the t-shirt currently sitting next to me in a pile of laundry waiting to be folded tells me that the Giants went on to win the division comfortably and then win the World Series. Am I expecting the Giants to win the World Series again? Not expecting, no. Repeating is incredibly hard and there are so many things that have to go right that it would be the height of arrogance and probably delusion to be certain. But saying that I’m as close to certain as is reasonable that they’ll have a good season? That I’m comfortable doing. Be frustrated when they play like they’re literally wearing clown shoes and trying to catch the ball with one of those plastic squirty flowers, wonder what mechanical glitch is causing Matt Cain to periodically go all dingerpalooza on us after pitching well for a few innings, but the panicking, hair tearing out, shrieking, wailing, lighting yourself on fire and walking into traffic level I’ve seen from some quarters lately just makes me sad. Not for the team, because I really do believe the team is going to be fine. Matt Cain will figure himself out, Buster Posey is being Buster Posey, Brandon Crawford is inexplicably also being Buster Posey, Pablo’s looking svelter to the general public with each murdered baseball and diving stop, and Madison Bumgarner is slidering and cuttering and sluttering the competition into small pieces on the regular. 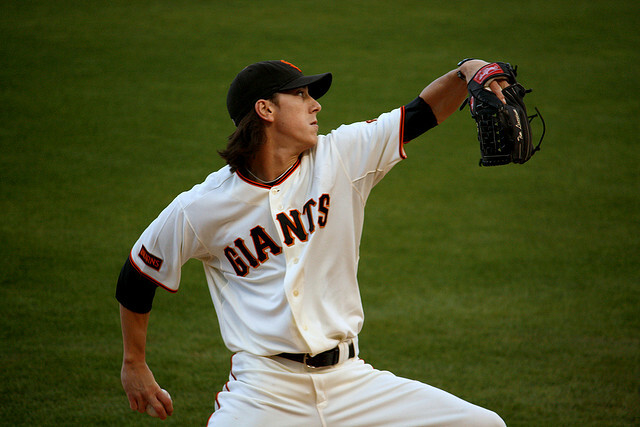 Hell, for that matter, Tim Lincecum is looking more like someone you don’t cringe at the thought of taking the ball and Hunter Pence seems to be swinging it better with his moulting cycle finished and his new carapace in place. But it makes me sad that people aren’t able to enjoy any of the good or interesting things because they’re so busy rending their garments. There are good things afoot, but only if you don’t panic. The best season by a shortstop in San Francisco Giants history, by WAR, was Rich Aurilia in 2001, when he recorded 6.7 WAR on the strength of 146 OPS+ and above-average defense. Aurilia is also likely the best shortstop over his Giants career, since the franchise moved from New York. At any rate it’s a relatively close race between Aurilia (who’s next best season, by WAR, was the previous one, with 2.4) and Chris Speier, who has the second- and third-best seasons by a shortstop in SF Giants history. Jose Uribe probably is third. Point is, the franchise does not exactly have a long tradition of outstanding shortstops.